Poster design for Kim Sings Kylie live at Joe's Pub. Image by Travis Chantar. Australian cabaret performer Kim David Smith salutes perennial pop goddess, Kylie Minogue, with an intimately fabulous cabaret-fantasia, celebrating Kylie’s catalogue of gargantuan hits and glittering deep cuts, from 1987’s "Locomotion,” all the way through to 2018’s “Golden.” Labeled the “male Marlene Dietrich” by the New York Times, Smith deconstructs three decades of Minogue dance anthems, with music direction by the multi-MAC Award winning Tracy Stark, and with costumes by Miodrag Guberinic (Katy Perry, Madonna, Nicki Minaj). Kim sings Kylie enjoyed a sold out debut at Joe's Pub at the Public Theater, NYC, on June 25th, 2018, returning for another sold-out engagement at Joe’s Pub in November 2018. For more information about backline, etc., please don't hesitate to contact Jeremy Katz at The Katz Company (jk@thekatzcompany.com). Australian Kim David Smith is a Helpmann Award nominated singer and cabaret performer, known for his Weimar-era inspired works that juxtapose authentic musical material with stylistic takes on current popular tunes. His electro-pop albums Nova, Supernova, and cabaret EP, The Tease, are available worldwide on iTunes and Amazon. 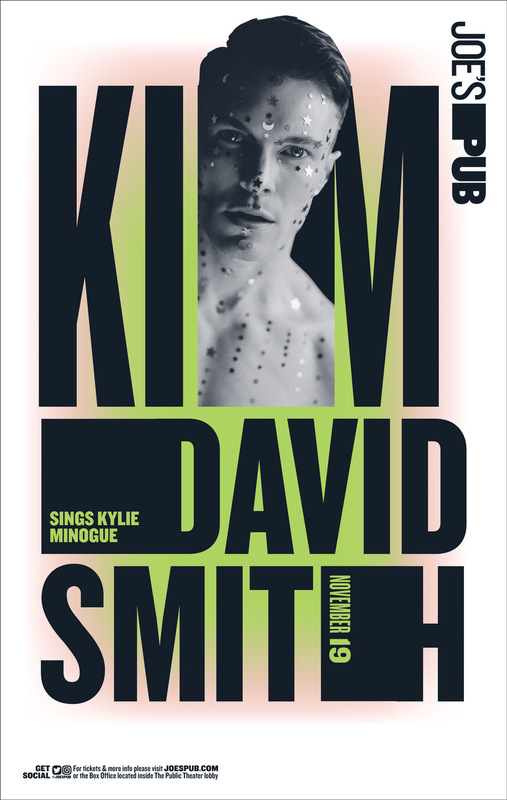 Poster design for Kim sings Kylie, November 2018. Image by Travis Chantar.